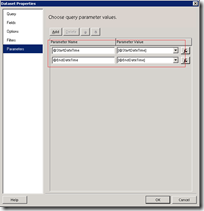 Let’s create a stored procedure in the OperationsManagerDW database. 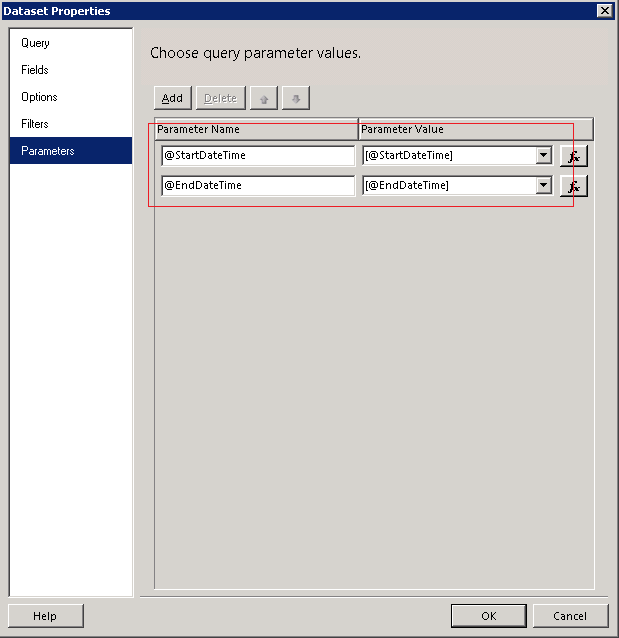 The stored procedure queries performance data for the rule with object name ‘Processor’, instance name ‘_Total’ and counter name ‘% Processor Time’. There are only two parameters, the start and end time. 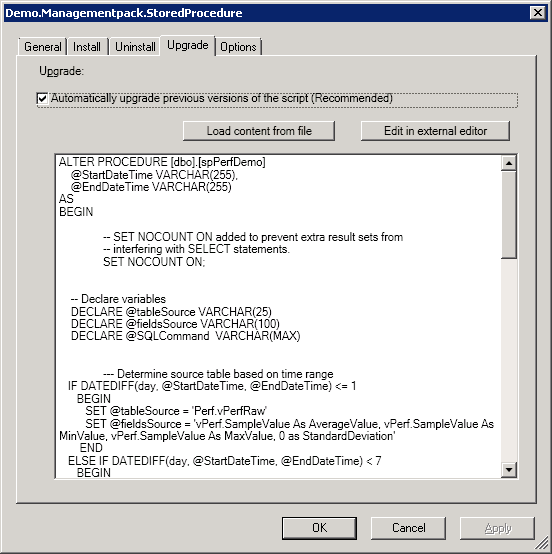 Now if we run the stored procedure with a start and end time with a range of less then one day (23 hours) then the data is retrieved from Perf.vPerfRaw. Since there is no average, minimum, maximum of standard deviation I’ve changed the source fields so it always returns the same columns (which is required if you want to create a universal report. If you look at the Message tab (where the SQL query is printed) you’ll see that the source table is Perf.vPerfRaw. …the data is retrieved from Perf.vPerfHourly . 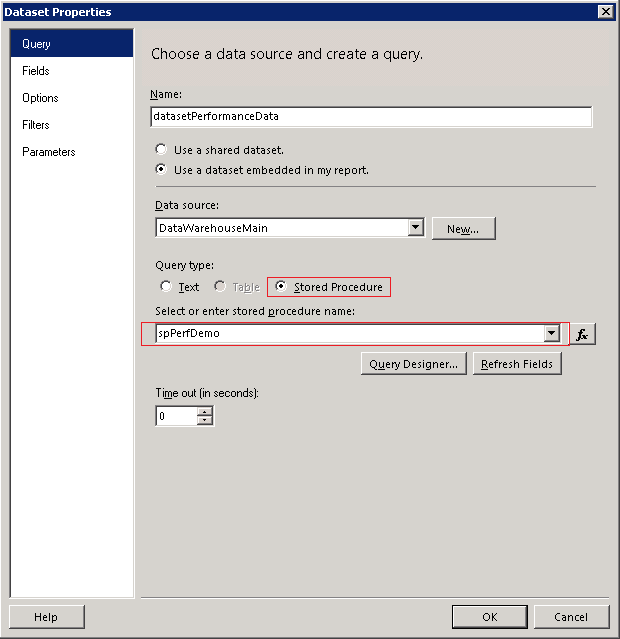 Now add a dataset to the ‘Report Project’ report in the Business Intelligence Development Studio (BIDS) and select the stored procedure you’ve created earlier. Don’t forget to add the parameters for the begin and end date. And create the report as you normally would. 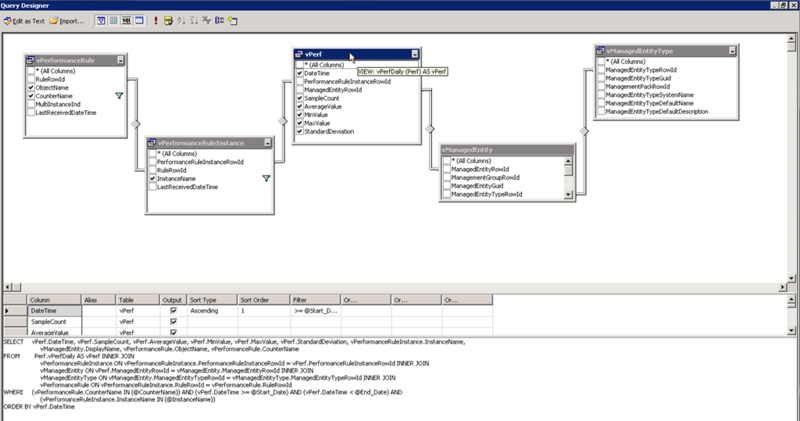 The next step is to add the report and the stored procedure to the management. This is done by creating a Data Warehouse Script. 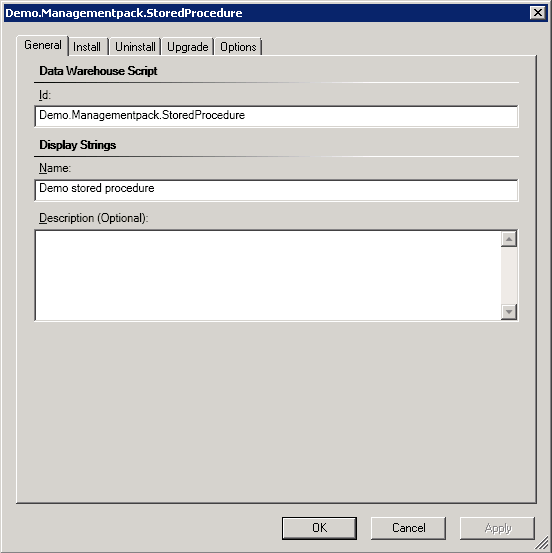 Finally you need to reference the data warehouse script from the report that’s using the stored procedure. Here are some pitfalls that you might encounter when creating your own. 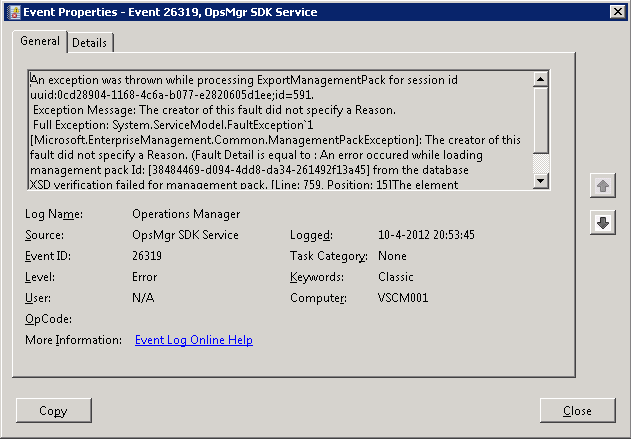 If you don’t set the upgrade script (the fourth tab) the management pack won’t import and an Event is logged from source OpsMgr SDK Service with event ID 26319. An exception was thrown while processing ExportManagementPack for session id uuid:0cd28904-1168-4c6a-b077-e2820605d1ee;id=591. Exception Message: The creator of this fault did not specify a Reason. Full Exception: System.ServiceModel.FaultException`1[Microsoft.EnterpriseManagement.Common.ManagementPackException]: The creator of this fault did not specify a Reason. 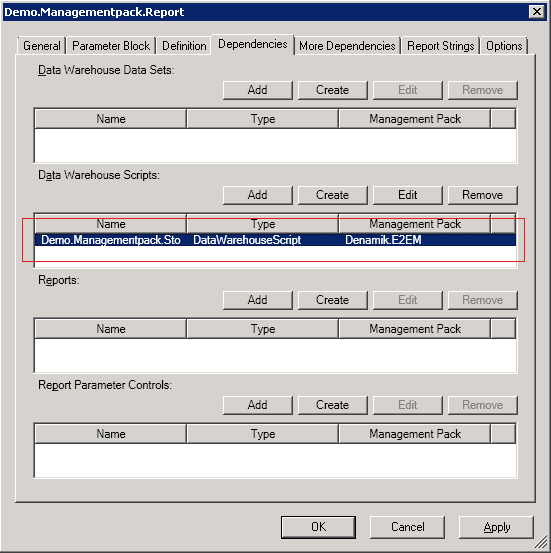 (Fault Detail is equal to : An error occured while loading management pack Id: [38484469-d094-4dd8-da34-261492f13a45] from the database XSD verification failed for management pack. [Line: 759, Position: 15]The element 'DataWarehouseScript' has incomplete content. List of possible elements expected: 'Upgrade, UpgradeUnsupported'.). An exception was thrown while processing ExportManagementPack for session id uuid:0cd28904-1168-4c6a-b077-e2820605d1ee;id=591. Exception Message: The creator of this fault did not specify a Reason. 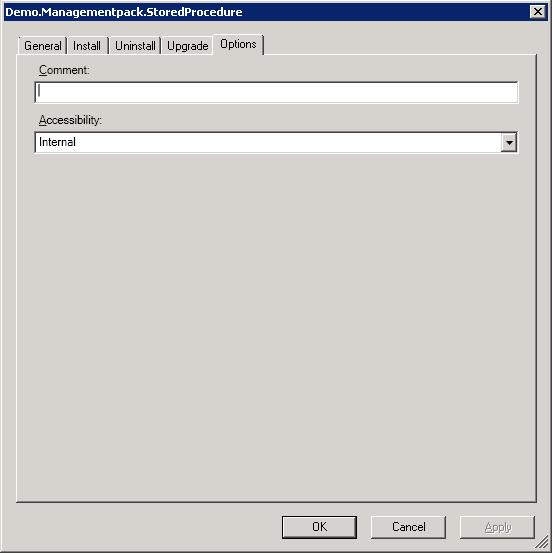 XSD verification failed for management pack. [Line: 759, Position: 15]The element 'DataWarehouseScript' has incomplete content. List of possible elements expected: 'Upgrade, UpgradeUnsupported'.). 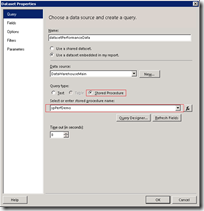 If you forget to grant the execute permissions to the OpsMgrReader login (see the last two lines in the install / upgrade script) the report is unable to retrieve data and the following error is thrown. An error occurred during report processing. 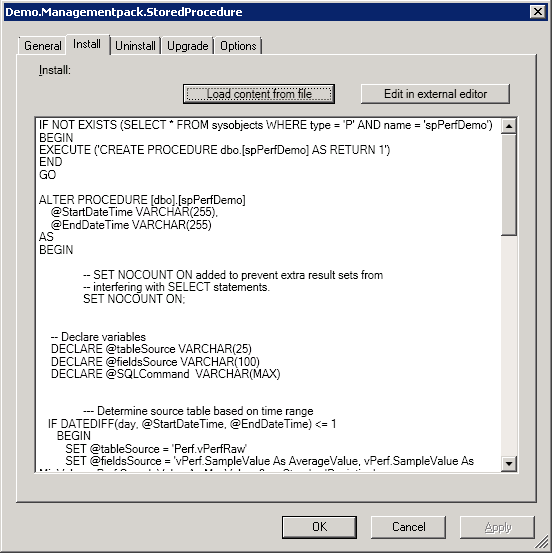 Query execution failed for dataset 'datasetPerformanceData' The EXECUTE permission was denied on the object 'spPerfDemo', database 'OperationsManagerDW', schema 'dbo'. An error occurred during report processing. 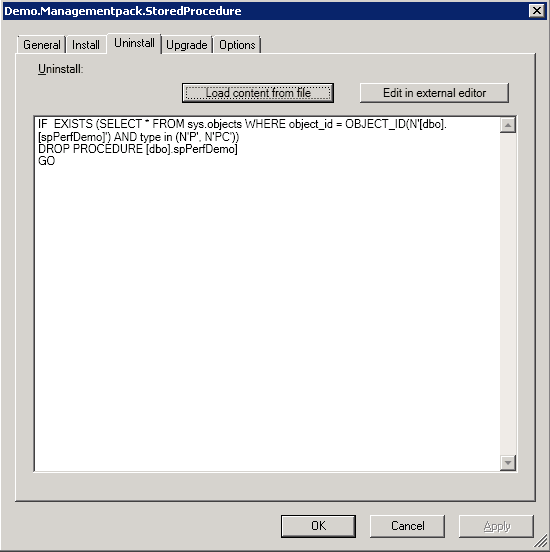 The EXECUTE permission was denied on the object 'spPerfDemo', database 'OperationsManagerDW', schema 'dbo'. There is a series group with more than one instance. If you export the report to a comma separated file (CSV) you’ll notice that for each instance multiple records are stored but only one has a value, the number of records match the number of instances. This is caused by the category group datetime. The line chart tries to show the data for each instance in time. Since the data is stored in raw format the timestamp doesn’t match exactly (probably off by a few milliseconds). The is “solved” by removing the milliseconds from the datetime with the CONVERT statement and using style 120 (ODBC canonical). 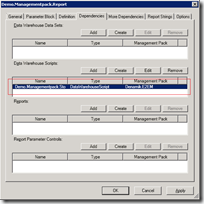 I want the Schema of OperationManager & OperationManagerDW, for reprting. please suggest for reporting how should I start. I want to show some meaningfull/usefull report(s).